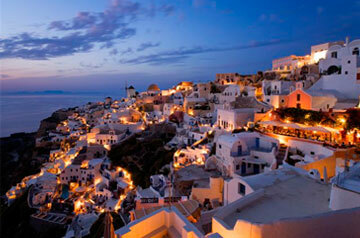 OIA MARE VILLAS are built on the Caldera cliffs in the most striking village of Santorini, Oia. Well worth a visit is the Venetian castle, the art deco galleries, cafes, tavernas, boutiques & gold shops, as well as Ammoudi Harbour with its Fish Restaurants. 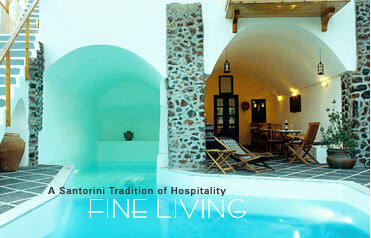 Santorini hotel Oia Mare Villas is a rare pleasure. Perched on top of the Caldera cliffs in the village of Oia, with a bird's eye view of the quaint fishing harbour of Ammoudi (the old port of Oia) Oia Mare Villas offers beautifully furnished traditional cave houses perfect for friends, newly weds & honeymooners. 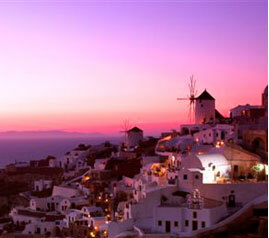 Santorini is famous world wide for its' sunsets. Oia Mare Villas's privileged location offers the best of views, be it sunset or sundown. The sparkling blue waters of the Aegean sea, clear sunny skies, magical colours on the horizon while sipping a refreshing drink at sunset ... Santorini Oia Mare Villas offers the best of everything. From a poolside Continental breakfast to special arrival transfers, excellent service & unique accommodation, perfect views & the opportunity to explore the island, this is an experience not to be missed.